The Outback Bowl is just days away, but with the holidays in full-swing, bowl coverage on this site has been sparse. That's all about to change. Here's some early game notes and a South Carolina scouting report to get you ready. The all-time series is tied 1-1, with Michigan winning the last meeting 34-3 on September 21, 1985. South Carolina is coached by Steve Spurrier who is in his 8th year there. His USC record is 65-37 and his overall 23-year head coaching record is 207-77-2. South Carolina is 10-2 overall this season with a 6-2 record in the Southeast Conference. The Gamecock's two losses this year came at the hands of LSU and Florida in back-to-back weeks on the road. Their biggest conference wins were Georgia 35-7 on October 7th, and at Clemson 27-17 to finish off the regular season. Much like Michigan, South Carolina employs two quarterbacks who can both run the offense if needed. But unlike Michigan, both of them should get an opportunity to throw the football in this bowl game. Junior QB Connor Shaw is the primary quarterback, while sophomore Dylan Thompson is a more than capable backup who showed that when Shaw went down with an injury that kept him out of a couple of games this season. Spurrier said that he would decide at halftime which QB will go the rest of the way against the Wolverines. South Carolina's offense is primarily a passing type of attack. Even with the capable Marcus Lattimore for much of the season, the Gamecocks struggled to move the ball effectively on the ground. But with Lattimore out from his gruesome injury against Arkansas, expect SC to rely even more so on their two QB's and stable of good receivers. Backup RB Kenny Miles has been filling in for Lattimore, but without their stud RB in the last 3 games, SC has only averaged 3.2 ypc. And speaking of good receivers, sophomore WR Bruce Ellington is a certainly one of those. The two-sport star who also plays point-guard for the USC basketball team tallied 38 catches for 564 yards, leading the team in both, and second on the squad with 6 touchdowns. He is complimented by fellow WRs Ace Sanders and Nick Jones. What they all seem to lack in size (all under 5-10), they make up for with speed and quickness. These receivers will be a true test for a secondary that is down one starting CB due to suspension (JT Floyd) and some new faces on the depth chart at the safety spots (Dennis Norfleet). The Gamecock's defense is ranked 12th overall nationally, giving up only 312.3 ypg. Oddly, Michigan is ranked just one spot ahead, 11th nationally, giving up 311.2 ypg. Without a doubt, the strength of this defense is it's front 7, one of if not the best group Michigan will have faced all year, and that's saying something. They have a very good pass rush, having notched 40 sacks this season, rated 5th nationally. The defensive line is good all over, but the standout of this group is DE JaDeveon Clowney who has 13 sacks of his own. He should be going up against Michigan's left tackle Taylor Lewan for most of the day. How Lewan plays against Clowney should decide how high his draft stock should be should he decide to leave early for the NFL. A lot of scouts will be watching. The secondary is good, but has proven to be susceptible at times this year. Against opponents who USC bottled up on the ground, Florida, Tennessee, Arkansas and Clemson, they gave up 12 passing touchdowns and those opponents averaged 61.1 percent completion percentage. For Michigan, who comes into this game with Devin Gardner who has a 63 percent completion percentage and has tallied 251.3 yards per game and 8 touchdowns, that could be a potential bright spot for the Michigan offense should the running game fall flat. ...they really must be hitting on all cylinders, especially on offense. What happened in the second half of the Ohio State game offensively, simply can not happen in this game. It will be imperative for Michigan to keep USC off-balance up front. If they can get the ball into Denard's hands in space, and exploit a possible advantage in the passing game, they might be able to pull out a win. Across the board, South Carolina is better at almost every position, and they are very well coached. But Michigan has played the tougher schedule, so it would seem that on paper, this could be a very close football game. Right now, I give the edge to the Gamecocks. Not what you wanted to hear, I'm sure. 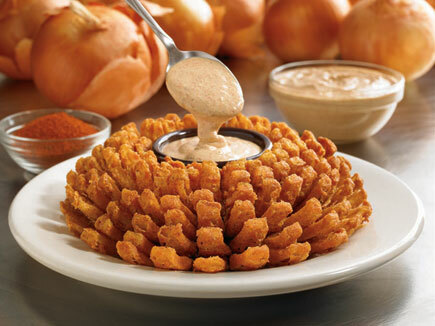 So here's a picture of a bloomin' onion to make you feel better.